And began to see through a glass darkly. After spending a few weeks writing a script, choosing the soundtrack, and preparing for her film acting debut, Joni went to Toronto in December 1980 to film her segment as part of a film anthology called "Love". The 9 stories in the movie were all written by women, and they each concerned themselves with the stated subject of love in its many forms. Others involved in the film in addition to Joni were Edna O'Brien, Lady Antonia Fraser, Penelope Gilliatt, Gale Greene, Nancy Dowd, Liv Ullmann, and Mai Zetterling, who directed her own segment, Edna O'Brien's, and Joni's. Joni's 14 1/2 minute vignette presented her as a black male pimp named "ART NOUVEAU", dressed in the same drag she wore on the cover of 1977's "DON JUAN'S RECKLESS DAUGHTER". Joni originally came up with this character when she had to create a persona for a Halloween party. The soundtrack she chose for herself was mostly Miles Davis music, as she told her hometown paper at the start of the project: "My vision of the relationship between the soundtrack and the visuals is very precise. The character I play, for instance, is a Miles Davis fan, and he carries the soundtrack around with him on a big portable cassette player". Joni also contributed the title song "Love", played over the opening credits, which she wrote setting the words of a poem from Corinthians to her music. The film's producers kept extending the release date further and further, a year, then 2 years. As late as 1985 there were still rumblings about a release, but as far as I'm aware, the completed film has never to this day had even one showing in theaters. I have had word of "Love" being shown during small film festival weekends. At a ceremony in Toronto's O'Keefe Center on February 5, 1981 Joni was in competition for a Juno Award as Canada's Best Female Vocalist, which she lost to Anne Murray. But Joni was also inducted into the Canadian Music Hall of Fame, and presenting the award to her was Prime Minister Pierre Trudeau. In her acceptance speech she remarked that receiving a Hall of Fame accolade like this one made her feel like hockey champion Boom Boom Geoffrion. Soon after receiving her Juno Hall of Fame award Joni left Toronto, and flew to the Caribbean for a six week vacation/writing expedition. With Joni out of the country, a rumor appeared in the press that she was recording with David Byrne of the Talking Heads when in fact they'd never met, and had no plans to collaborate. What she was doing was visiting friends, writing songs, and painting prolifically. Rolling Stone magazine reported that she visited film director Perry Henzell, who was well-known as director of "The Harder They Come", starring reggae singer Jimmy Cliff. While visiting Henzell, she painted a large mural on one entire wall of a room in his house. The painting was going well. She found various colors of paint around the house but needed some yellow and couldn't find any, so she drove forty miles to the nearest shopping area. Arriving there, she found that it was a local holiday and the stores were closed, but she spotted an old man painting curbs with yellow paint and persuaded him to sell her some of it. Unfortunately, the only means she had of transporting the paint back to where she was staying was inside half a coconut shell sitting in a cardboard champagne bucket. By the time she had driven the 40 miles back, she found that all the yellow paint had splashed out of the cocunut shell and into the cardboard bucket, which leaked, leaving only a few teaspoonfuls. Joni said, "That paint was like gold. But I finished the mural. It was that intense and that magical". Joni was also in the islands to get the feel of the music. Reggae was playing everywhere she went, and when she visited a local disco 3 or 4 times a week to dance, she heard the popular songs of the day. This was where she was introduced to the pop-rock polyrhythm music of groups like Steely Dan, Talking Heads, and especially the Police. She fell in love with their music, and was so impressed with the song "De Do Do Do, De Da Da Da", with its shifting rhythms, (She said, "My feet loved that record"), that when she got back from the islands she contacted Sting and the boys and asked them to record with her. They were busy mixing in Montreal at the time, and she was busy in L. A., so the collaboration regrettably never happened. Joni told Musician magazine about her admiration for the Police: "Their rhythmic hybrids, and the positioning of the drums, and the sound of the drums, was one of the main calls out to me to make a more rhythmic album". 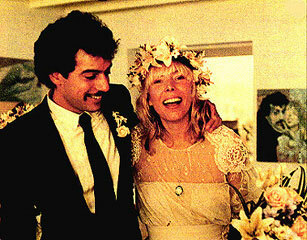 Joni and larry on their wedding day, November 21, 1982. Once back in the states, Joni began looking for musicians who could capture the polyrhythms she'd heard and help her match them to new melodies she'd written while on her working vacation to the Caribbean. 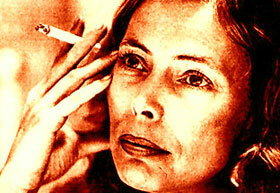 Joni had lost her radio airplay with the MINGUS album. Programmers with little imagination didn't know what niche to put her in. Was she a jazzer, a folkie, a pop singer, a rock singer, or what? Partially because of that fact these new songs were intended to be more accessible and appealing to the mainstream. She spent a couple of weeks alone in New York City, painting and trying to come up with a few new uptempo pop tunes by strapping on the guitar and dancing around her loft. Joni told Musician magazine: "With the MINGUS project, nobody was anchoring the music, everything was floating all around, and I was playing around with structure. At a certain point, I began to crave order again". For a year and a half, Joni worked meticulously on the tracks, recording some of them 4 times with various musicians until finally finding the right rhythm section in a drummer named Vinnie Colaiuta, and in a bass player named Larry Klein (southern California born and bred), who was also a sound engineer. In Klein, Joni also found a kindred soul, a friend and a lover. Their relationship began to flourish with conversations conducted while playing the pinball machines at A & M studios where they were recording the album "WILD THINGS RUN FAST". 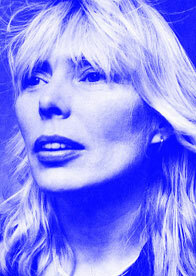 Joni told Musician magazine: "Larry and I listened to a lot of fads and we tempered them...Larry is a "sounds" man. His ear hears certain things and he'll point them out to me. So a lot of (the sound of the album) has to do with Larry's input. Credit where credit is due." Joni dedicated the album with this message: "Special thanks to Larry Klein for caring about and fussing over this record along with me". John Guerin played drums on 4 cuts on the album. Vinnie Colaiuta performed on the remaining 7. Russell Ferrante and Larry Williams each played synths on a few cuts during the sessions. Steve Lukather of Toto fame soloed on electric guitar on 4 songs, Mike Landau on 4 others, and Larry Carlton played on 1. Wayne Shorter also added his memorable sax lines to 3 tunes. Guest vocalists on the album included Lionel Richie, who was featured on a couple of prominent solo lines, Kenny Rankin, Charles Valentino and James Taylor. In late summer 1982, with the recording sessions finished, Joni was photographed over a period of a few weeks by Israeli born photographer Moshe Brakha. None of the resulting shots made it to the album cover as originally intended, but one photo taken in Joni's Bel Air home was used as the cover of the album's first single, "(You're So Square) Baby, I Don't Care". While the album was being readied for release, Joni's friend David Geffen, founder of Asylum Records, decided to start a new label, Geffen Records. As one of his premiere artists, he wanted his old friend and client Joni Mitchell. However, Joni still owed Asylum one record on her contract, and up thru the fall of '82, a new album from her was on their release lists. But when "Wild Things Run Fast" was finally shipped to record stores in late October, it was, indeed, on the new Geffen Records label. It appears that Geffen's power and influence was able to negate the remaining obligation Joni had with Asylum. Other artists who went with Geffen to his new label were Elton John, Donna Summer, super-group Asia, and later Don Henley. On November 21, 1982, Joni and Larry Klein married in a ceremony performed at the Malibu home of her manager, Elliot Roberts. The album was greeted by critics as a return to pop with its crisp sound and fastidiously produced tracks, and some positively peppy tunes like "Solid Love", "Underneath the Streetlights", and "You Dream Flat Tires". The album, unfortunately, peaked on the Billboard charts in it's 5th week at only #25, and the single, Joni's remake of the Elvis chestnut "(You're So Square) Baby, I Don't Care", climbed as high as #47, merely threatening to become a hit single. (Radio walls continued to be solid rock). One night that winter, Joni visited her old friend, folk musician Eric Anderson, and jammed with him after his gig at the renowned McCabes Guitar Shop in Santa Monica, California. As 1983 began, Joni was still doing promo chores for the new album, and in February she held a series of rehearsals culminating in a night at A & M Studios, Hollywood, where the show was videotaped for use as live performance videos that would hopefully be played on MTV and other early video channels. I've seen 3 of these performances taped from airings on a Canadian video channel: "Chinese Cafe", "You Dream Flat Tires", and "Underneath the Streetlights". "Yes I do--I love you! I swear on the disco sparkle dark I do! Joni then began the most far flung and lengthy tour she'd ever undertaken. She started in Osaka, Japan on the 4th of March, and continued on to Tokyo on the 6th and 7th (these two shows were recorded for a later FM broadcast in Japan). Refuge then flew to Australia and on the 22nd performed at the beautiful Sydney Opera House. Then to Ireland and the U.K., where their gig at London's Wembley Arena on the 24th was taped for a truncated broadcast on radio, and also filmed for a 60 minute BBC concert special. Two days later, they were in Brussels, Belgium (also a radio broadcast), and then, all in one week, they played Paris, France; Frankfurt, Germany; and Milano, Italy. After that, a leap thru Scandinavia where they performed in Stockholm on the 12th of May, and Copenhagen, Denmark on the 15th. Then Joni and Refuge headed back to the U.S. for a well deserved months vacation. In mid-June, the second segment of the tour started. The group performed at Red Rocks in Colorado on the 10th, outside San Francisco in Concord, California on the 12th, the Universal Ampitheater in the L.A. area on the 14th, and then cross country thru the U.S. towards the East Coast, hitting Norman, Oklahoma on the 29th, Detroit on July 4th, Columbus on the 9th, Pittsburgh on the 10th, Toronto on the 12th, and New Jersey on the 16th. When Refuge did an afternoon outdoor show in Boston on the 20th, Joni got some bad press for walking offstage five times during the show. Whether her frustration resulted from malfunctioning equipment, or from the audience being too noisy, in reality it was a combination of the show being a rare one for Joni in the daytime, the crowd's natural rowdiness adding distraction, and the disappointing fact that this concert was at the end of a long, grueling tour played in venues that were mostly only about 2/3 full. The tour played out it's final date in late July. Joni later claimed that after all her musicians and expenses were paid, she grossed a grand total of only $35,000 from the entire world tour. That fact is IMHO probably the main reason why she hasn't toured since 1983. As 1984 began, Joni & Larry were hard at work on a film of the 1983 tour, which intertwined live in-studio performances with splices of homemovies shot by the couple, and bits from films like the Luis Bunuel directed "Viridiana", "Koyaanisqatsi" (with it's fast-motion cityscape scenes), and the Michael Wadleigh rock festival epic "Woodstock". Their film was released on Pioneer Artists LaserDisc as "Refuge of the Roads" in the fall of 1984. It was not available in the VHS format until early in 1989. Joni's art continued to flourish, and twice during 1984 she had an exhibit of her canvases at Kamikaze, a combination cafe and gallery located in New York City. This article has been viewed 22,357 times since being added on March 28, 2009.